Envious of your Mac buddies with their cool-looking transparent Dock instead of the Start Menu? Without going into details that such a system has been around much longer than Mac OS X has, Windows users can now install a similar-looking Dock at the bottom of your Windows desktop with Nexus! Nexus is a completely free dock for Windows with support for many features. 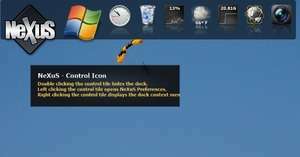 While there is also an ultimate version with some more features, the free version of Nexus includes support for worldwide weather forecasts, transparent icons, display on the system tray, a net meter module for a visual output of network usage and support for easily switching icons by simply dragging PNG, ICO and TIFF files directly onto the current icon. Version 19.2.0.1164 is a freeware program which does not have restrictions and it's free so it doesn't cost anything. For security reasons, you should also check out the Nexus download at LO4D.com which includes virus and malware tests. Additional screenshots of this application download may be available, too. Winstep Nexus Dock has a presence on social networks.